A person commits the crime of criminal trespass in the first degree when he or she knowingly enters or remains unlawfully in a building. That this act occurred in the State of Washington __________________[City of ]__________________[County of ]. Criminal trespass in the first degree is a Gross Misdemeanor, punishable up to 364 days of jail and a $5,000 fine. 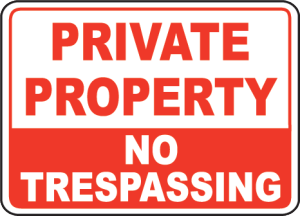 A person commits the crime of criminal trespass in the second degree when he or she knowingly enters or remains unlawfully in or upon premises of another. That this act occurred in the [State of Washington][City of ][County of ]. The actor was attempting to serve legal process which includes any document required or allowed to be served upon persons or property, by any statute, rule, ordinance, regulation, or court order, excluding delivery by the mails of the United States. This defense applies only if the actor did not enter into a private residence or other building not open to the public and the entry onto the premises was reasonable and necessary for service of the legal process. Writes, paints, or draws any inscription, figure, or mark of any type on any public or private building or other structure or any real or personal property owned by any other person unless the person has obtained the express permission of the owner or operator of the property, under circumstances not amounting to malicious mischief in the first or second degree.